Identifying threats and getting paranoid; insisting on optimism and burying your head in the sand--it's a daily struggle to find the balance. There are real dangers in all of our environments, some of them undetectable to us, whether an odorless gas, a flavorless chemical, an attacker under the bed, a disruptive frequency. On the other hand, it's possible to become so stressed and doom-laden that we sicken and paralyse ourselves. You might not have guessed, but my slight tendency is toward head-in-the-sand and hope for the best. Yes, I won't eat or drink out of plastic, but I still use the Vitamix with its "non-BPA-but-still-plastic" pitcher daily (although I'm saving for a stainless steel pitcher for it). I'm aware that electromagnetic frequencies can disrupt our own vibrations but I use Wi-Fi and a cellphone. I've been known to put oil in my car and not wash my hands right after, and to eat food that's burnt brown/black, known to be carcinogenic. I pay attention, but I try not to be alarmist or strident. This time, though, I caught myself applying standards inconsistently in a way that, if the standard has any merit at all, is potentially dangerous. Sometimes a substance gets a free pass just because it isn't something else. Let's take a closer look at Tetra Pak. If it isn't BPA it isn't necessarily off the hook. Which is why I only have glass and steel containers and am eager to get a steel pitcher for my Vitamix. So why on earth do I even care about Tetra Pak and cans? How are they even in my life? A good question, given my whole/fresh-food orientation. Over the past few years, it's become clear that I do best getting most of my calories from coconut. I was doing this with canned coconut cream (non-BPA liners!) off and on for a while; it's highly convenient. Fresh brown coconuts, unfortunately, are moldy too often to rely on for a staple. Coconut butter has more fiber than coconut cream does, which might be a good thing but makes it slower for throwing together a smoothie on the way out the door, and in cool temperatures it's harder to work with. So, when I discovered these packs of three slightly-more-than-quart-sized containers of coconut cream with no gums or other additives , in the same packaging that one commonly finds coconut water, juice (kids' drinks! ), etc., I didn't stop to think too much farther than "yay!" Of course, as soon as I opened a carton (warming it up and shaking very thoroughly so the cream was homogeneous) I would decant all of it into glass jars. But this was as much for convenience as out of concern for the Tetra Pak. That way I could put what I was using today in the door of the fridge and the rest at the bottom and back where it's colder. I've never had it spoil. Which is interesting in itself, given that coconut is the only ingredient and I know from experience that fresh coconut cream begins to spoil (or improve, if you promote good bacteria) within just a couple days or so. But in Europe and the Middle East, the stereotypical association for Tetra Pak is with UHT (ultra-high-temperature) processing for extreme shelf-stability. Noting the longevity of my coconut cream, I started wondering how hot it had gotten when packed, which led me to wonder what it was sitting in when it got so hot. Digression: I didn't really want to wonder this. Didn't want to attend to the little voice itching away at me. Why mess with such a good thing when I have such a hard time with food? I spend way too much energy worrying about food and how my body's going to react to it. Coconut cream works for me. This particular brand tastes delicious, I love it, my body loves it... Too good to be true? Well, yes. Having made coconut cream from scratch by hand--even having made it from scratch with an electric juicer--it did seem kind of too good to be true. Very inexpensive too, and whistle and Amazon will bring it. I had to know. What's it made of? Tetra Pak themselves will proudly tell you: it's cardboard reinforced with aluminum, with polethylene (PET plastic, like that used for the #1 water bottles) coating the inside (in contact with the product) and the outside. Um. So my coconut cream's essentially in a #1 plastic bottle, and was probably heated to a very high temperature when packaged. I won't drink water out of those bottles because it's "estrogen water"; the plastic is known to leach estrogen mimics into the water Guess what sort of molecule actually carries and absorbs hormones and hormone disruptors? Yup, a fat molecule. What's coconut cream mostly composed of? You got it, fat. That's why I didn't want to get coconut cream in cans. What do I do now? Do I say "never mind, it's probably not as bad as BPA, and I've never felt any ill effects from it" "we all have to make compromises"? Or do I go start drinking water from plastic bottles--might as well, since I've been drinking fat stored in the same substance? Although the latter sounds brutal, it's the more intellectually honest response. In fact, at the very minimum I should quit using this form of coconut as my main source of calories and save it for occasional use, and I should seriously consider not using it at all, and also not buying Tetra Pak coconut water as I have done occasionally. Buying shredded coconut (least processed, least amount in contact with plastic packaging) and making it into coconut butter in the Vitamix myself might be the cleanest solution with the least extra work. If I'm going to do that, though, I'll definitely need that stainless steel pitcher as a priority. This is one of those times that ignorance was bliss, that "if it seems too good to be true it probably is," and that I had to go on sixth sense (the awareness of ignorant bliss) and a sort of faith: faith that with some research I'd be able to find the facts, and faith/belief that something I can't physically feel hurting me, like a plastic carton liner, could be harming me without my realizing it. As I said at the start, I tend to err on the side of head in the sand rather than strident whistleblower. But this is something I was choosing to ignore. I finally listened to the little voice inside and did the research, and now I'm forced to be more honest and consistent about how I treat myself, let alone what I choose to feed others. If I wouldn't even drink water out of plastic for what I believe to be good reason, I'm sure glad I now know that that's what my coconut's in--never mind ignorance is bliss. If you want some more research on Tetra Pak itself, and of the question of plastics and estrogens, this study from 2009 suggests that estrogens leach into mineral water from both plastic (PET) bottles and Tetra pak, but that the latter may be an even worse culprit; the water packaged in Tetra pak had higher levels than that in the plastic bottles. They measured for estrogen in mineral water in glass bottles too, and even some of that had estrogen in it. Glass leaching estrogen? Not likely...The "estrogen water in glass" came only from a specific spring, whose water packaged in other materials was even worse, so it's likely that there was some contaminant either at the spring itself or at the packing facility. Not only does the study show that the water contains estrogen; a mollusk allowed to live in the "estrogen water" was unambiguously influenced by being in said water, producing twice as many embryos as the control. Mollusks are considered "sentinel species," like the canary in the coal mine--what happens to them could happen to us too. In other words, we should care about this. A couple further thoughts: Tetra pak is often overlooked as a source of estrogen, perhaps because being somewhat recyclable gives it a halo, and in order to be aseptic (germ free) and long-term shelf stable, high heat (and possibly UV light and hydrogen peroxide too) is involved in the packing process, which would only accelerate release of estrogens. Thank you so much for writing this piece! I have been buying chocolate milk in tetra-pak packaging and always wondered why the carton aways looked like it was going to explode. When I open it an odorless gas escapes. Like your self, I too am conscious of what I feed my family and provide mostly organic at the table. But this tetra-pak packaging question always comes to my mind "why all that gas & that can't be good for you"? Hmmm.....I don't dare eat anything out of that packaging now. Your right, everyone is hung up on BPA that tetra-pak is under the radar...at least for now. Thank you so much for your comment! Yes, that bulging and morphing of the packaging is another scary sign, isn't it? When you think about it, that's similar behavior to the PET plastic bottles, which are the same substance. We try so hard to be conscientious about what we put in our own bodies and offer to our loved ones, and it's amazing how difficult it can be. I know I have to compromise, and often, but consuming as a staple a fatty substance that's been marinading in plastic proven to be estrogenic is scary scary scary! I hope we can get the word out that Tetra pak isn't necessarily fine just because it isn't a can. It looks so innocently cardboard on the outside, but try tearing up one of those cartons and you soon realize how much plastic there is. so glad I came upon this info...my daughter has alerted me to the badness of these paks. Thank you. I'm so glad if it was helpful. I'm back and forth on the tetrapak again--mostly I avoid them, but sometimes convenience trumps perfection. I think it's most important that the inside PET plastic, in contact with the food, does NOT get exposed to high temperatures, so I would like to find out for individual foods how much heat is involved in the packing/sealing process. Hi Ela, PJ here from LM group. Thanks for checking this out. I'd wondered about these packs before but I also get overwhelmed and take the head in the sand strategy sometimes ( but those little voices never stop! ) What are you using now for coconut cream? I'm horribly guilty of head-in-the-sand. On the other hand, choosing not to immerse ourselves in bad news is probably wise. I try to think of it as curating the content of my universe. Obviously, if something constantly in our lives has negative impacts it's wise to know that--and yes, especially since the coconut cream was my majority source of calories those little voices were getting louder. I miss my coconut cream. And I'm experimenting. What I've been doing right now is using coconut oil and mct oil to equal the same amount of calories (~200) that I was using for each of my two daily smoothies, and increasing the herbal tea volume. 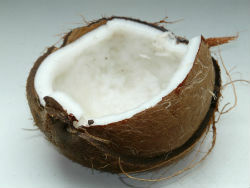 Obviously that's pure fat, whereas the coconut cream has small amounts of carbs and protein too. I'm also going to try coconut butter (or "creamed coconut"/"coconut manna"), whose nutrition profile is closer to coconut cream but with more fiber. I might end up doing a combination of all three of those. Another thing I'll try is making coconut cream from shredded coconut and straining out the pulp, but I'll have to make time for that, or anyway recreate the habit (I used to do it all the time). If I can find non-moldy fresh coconuts, I'll make it from them. You can get grated/shredded coconut and whole young coconut pulp in the freezer at Asian markets. They're in plastic, but I worry less when they're frozen, so that's another possible thing to try. Oh, yes, that is the same thing as "coconut butter"/"coconut manna"/"creamed coconut." There are so many different names for it, but it's basically the same concept as almond butter--or 100% chocolate, for that matter--the whole nut is slowly ground until the fibers break down and the oils separate (also called "conching"), which is why coconut butter is denser than coconut cream (dry) but otherwise still contains all the constituents of whole coconuts. I love coconut cream, but coconut butter might be even more delicious. I know that Tropical Traditions's products are excellent, but you can probably find coconut butter for less. Or, if you have a Vitamix or a strong food processor, you can make it yourself from shredded coconut. You should use at least two cups, stop and scrape down the sides regularly, and be aware that it'll take a few minutes. I have a Vitamix - want to try your method. Thanks Ela, you are a goldmine of knowledge! It seems that your link to the 2008 study is broken. Is there any other way to find this study? Do you have its formal title so I can search for it in google? Thanks for letting me know the link is broken. Another commenter is suggesting that the facts are incorrect more generally, so please bear with me as I dig a little deeper; I'll probably end up writing a new/revised post. This was extremely helpful. I'm in the middle of a detox with the Whole30 diet and have been alarmed at all the recommended foods that clearly come in Tetra paks. So, if I'm trying to address migraine headaches, eating/drinking more foods with estrogens is seriously counter-intuitive. This was my hunch, and here you've spelled it out for us. I really appreciate your research. I hope your Whole 30 is going great! Thank you for your comment. According to a later commenter, I may have my facts wrong (although I was in good faith and it's what my symptoms at the time suggested). I am going to look into it and write a revised post if it seems right. That said, minimizing packaged foods always seems like a good idea if it is possible. I have searched high and low and in regard to the aseptic (sterile) cartons, the same ones you show in the 3 pack coconut cream photo, which are either Tetra brik or Recart packaging. All of the companies that make aseptic brick cartons use LDPE as the polyethylene plastic. I agree Tetra is a bit vague on this on their website, but in 2013 they were actually working with their supplier Braskem to supply a bio-LDPE sourced from sugar cane in Brazil. Now the link you provide (for what Tetra Paks are made of) goes to the Tetra Evero line of bottles, which are a whole new species of Tetra-pak and not the ones you showed in the 3 pack picture. Now if your argument was about these bottles I would totally be with you, they do use PET plastic and that's horrible. As far as the pasteurization, for aseptic cartons this is typically UHT (Ultra High Temperature) and it is done for a total of 3 (three) seconds while en-route to the cartons, so by the time it gets to the cartons it is cool again, destroyed by the heat but cool by the time it gets to the carton. Traditional pasteurization is heated only half as high and the temperature is sustained for 20 (twenty) seconds. Either way pasteurization makes fat evil. Thank you so much for writing! Please let me assure you: my intention never was to scare people. When I wrote this post (almost two years ago), I was quite scared myself, and I thought I was noticing symptoms in myself congruent with the presence of #1 plastic in those coconut cream cartons (said coconut cream being my main source of nutrition at the time). I did my best at the time with the research available to me, and I would love to update if my facts were incorrect. If you would be willing to point me in the right direction, I will write a new post updating/correcting the information and, of course, crediting you for setting me straight. And of course I'll put an "update" banner on the old post too. I greatly appreciate your helping me spread information and not its converse.